This month's Craft Challenge from Rosie at Craftbotic is to make some budget home decor. As soon as I saw the challenge I knew exactly what I was going to do. I was really pleased with the result but it took a bit of trialing to get there so I thought I would share with you how to make one of your own! The technique would work for whatever design you choose to add to your shade, I decided to add a skyline as I have always found them quite beautiful! 1. Turn on your lamp and gauge how thick the lampshade is. I found that my lampshade was too thin and let loads of light through. This meant that when I did the holes for the silhouette first time round, they didn't show up because there was no contrast against the lampshade itself. If you decide the shade is letting too much light through, cover the inside with dark card - I used a couple of A4 sheets of black card. I drew round the shade to get the shape and then trimmed it to size, trying it on the shade every so often to make sure I had a good fit. Use a glue stick to secure the card to the inside of the lampshade. 2. 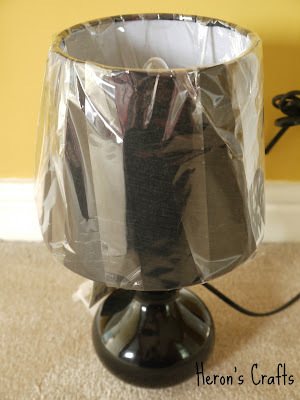 Get your template and sellotape it to the lampshade - if your shade is tapered like mine you will need to add pleat-like folds near the top to make it fit, just ease it round until your desired stencil is flat against the lamp shade. 3. Using a thick needle, poke holes all the way round your outline. I added a moon and stars as finishing touches. 4. 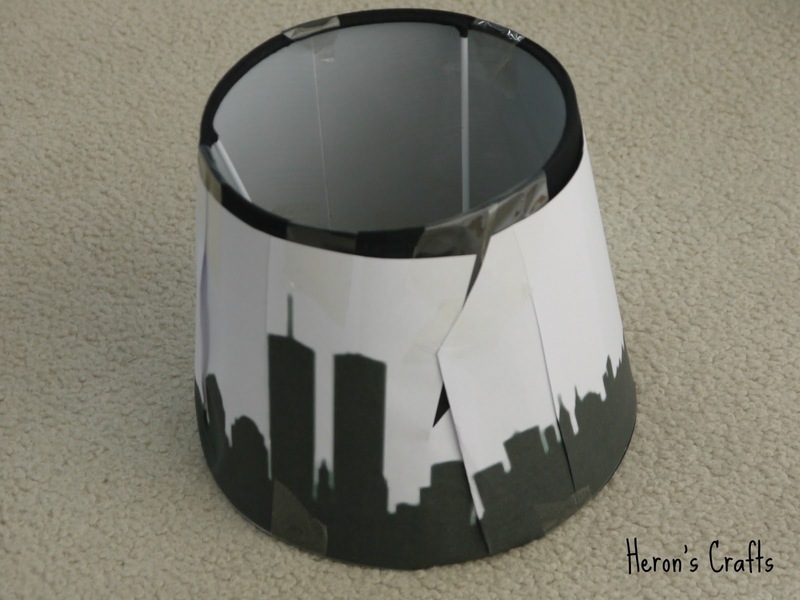 Remove the stencil, and try your lamp out! I am looking forward to this lamp finding a home where ever I may be living next year! Very pretty! I like those lamps, I may play at making one too! So cool! I've seen the same pin and have been drooling over it ever since - I love that you actually made it! How fantastic. I can imagine the pretty patterns that one could create with such a project. 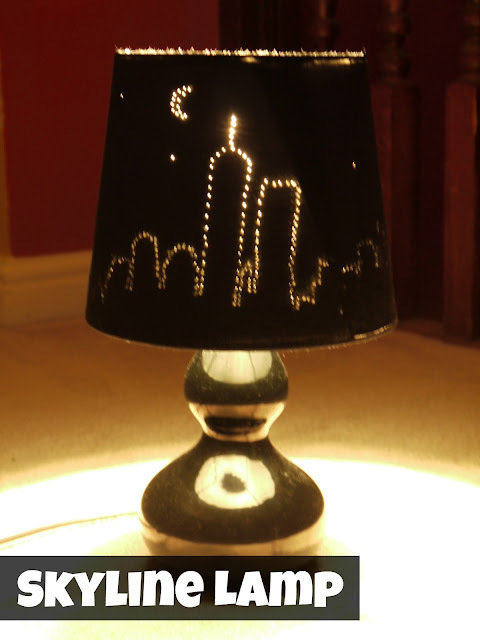 I would love one with the London skyline on so that I can think of home when in Germany. Hope all is good with you my lovely.....you all finished Uni yet?